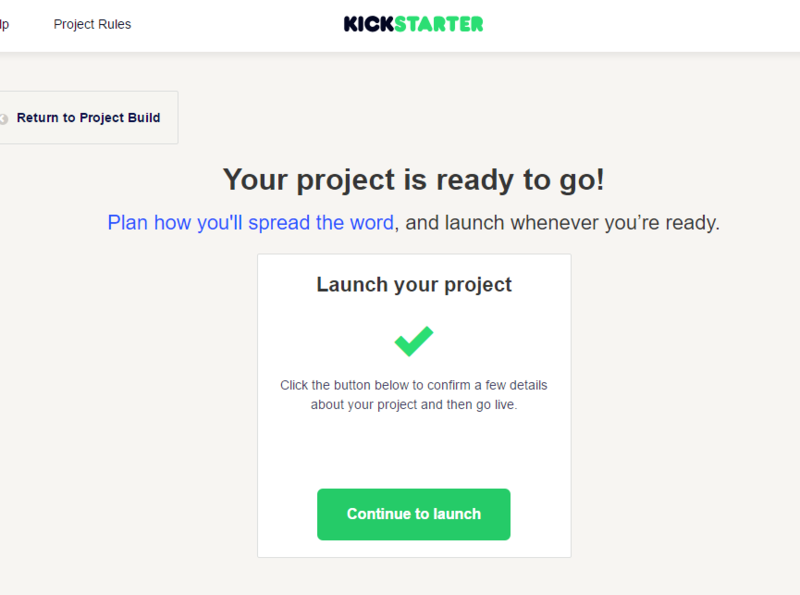 Kickstarter – What happens when you press the “Continue to launch” BIG GREEN BUTTON? Ever wonder what happens when you go to launch a Kickstarter campaign? I wondered. I couldn’t find any information about it. First you submit your project for approval. 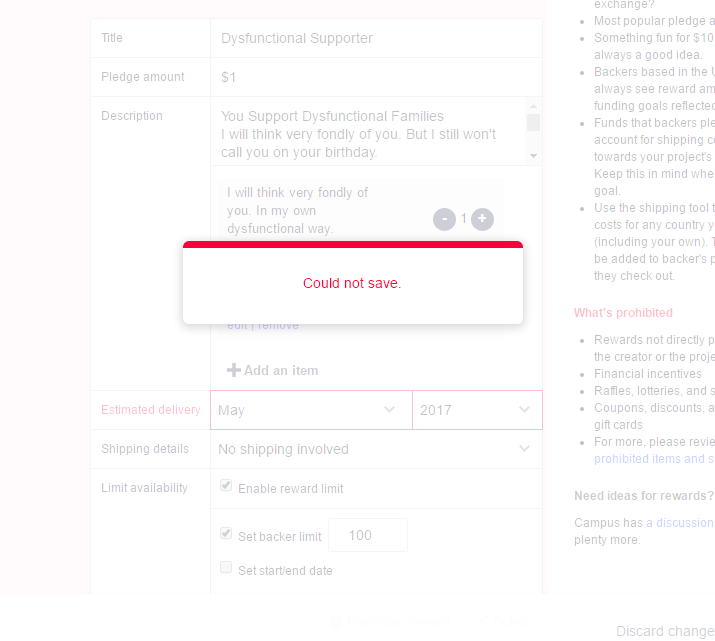 Depending on some mysterious formula, it will either take a few days for a human to review it or the website will instantly approve your project. In my case, I got instant approval and was presented with the “Continue to launch” BIG GREEN BUTTON. Ah… but what happens when you press the BIG GREEN BUTTON ? This is very simple. Confirm the funding goal, who gets paid, the date the campaign ends, etc. I will think very fondly of you. But I still won’t call you on your birthday. You’ll get the black & white PDF of Dysfunctional Families you can print, cut out, and play. This PDF is available for free on the website igpay.com. Since not calling a backer on their birthday is something that I can do immediately, I had the delivery date for this reward set for either January or February (I don’t remember which, but my thought was it would be effectively immediate). Why not? 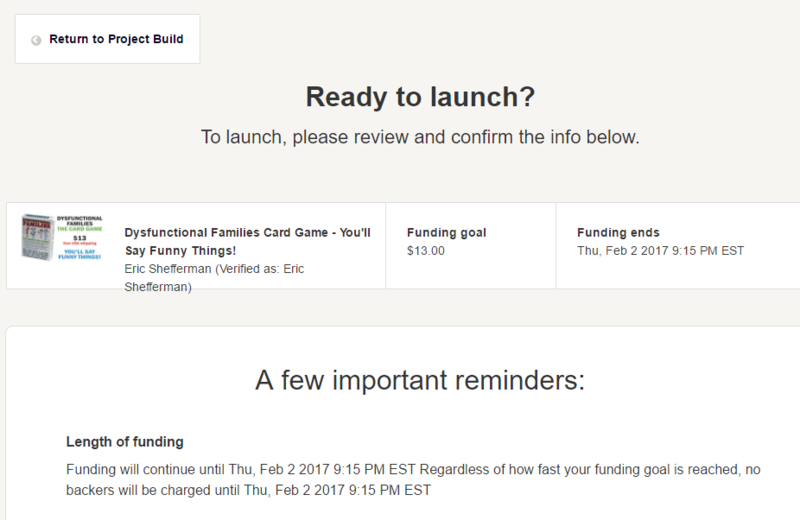 Kickstarter doesn’t want rewards to happen before when it thinks the project ends. And rewards are specified by month whereas end dates are a day. So I think I had said I’d deliver the reward in February but the project ends February 2. I wasn’t able to save the updated reward date in May and thus was stuck with not being able to launch my Kickstarter and the clock is ticking because I wanted to launch it on the dot at 9:00 am and it is getting later and later I can’t figure out what to do! Finally, I logged in with a different browser and edited the campaign FIRST to set the reward date to May, and then I went to the launch and it worked smoothly. So that was my harrowing start to the day! 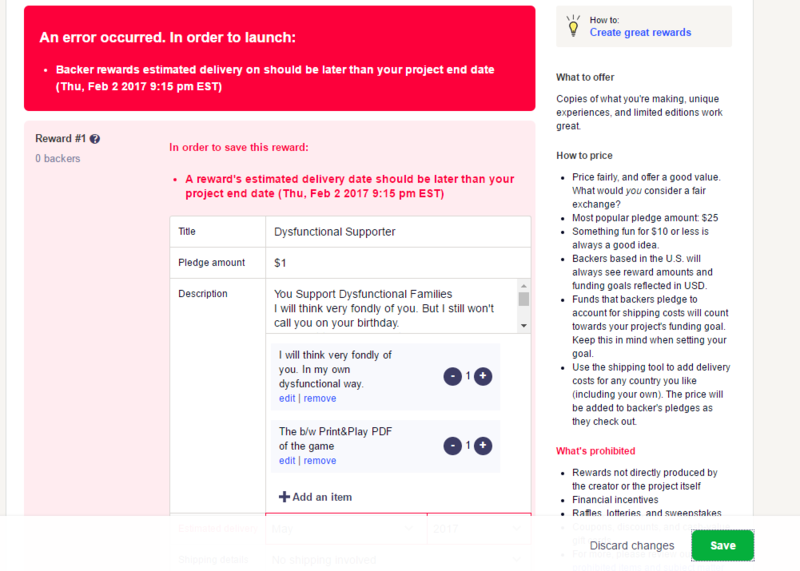 And now the Dysfunctional Families Kickstarter is live here.